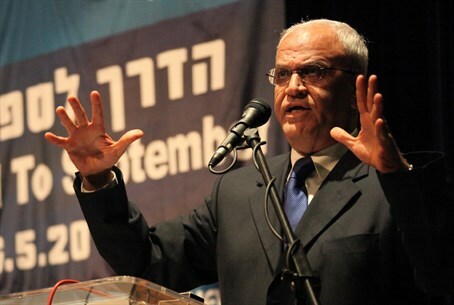 'Settler terrorism' responsible for attack which killed a toddler, Saeb Erekat insists; 4 IDF battalions dispatched. The Palestine Liberation Organization (PLO) terror organization behind the Palestinian Authority (PA) holds the Israeli government "fully responsible" for the death of a toddler in an arson attack Friday in the Samaria Arab village of Duma, it announced Friday, in an incident the IDF has labeled "Jewish terror." "We hold the Israeli government fully responsible for the brutal assassination of the toddler Ali Saad Dawabsha," PLO official Saeb Erekat said in a statement, according to AFP. "This is a direct consequence of decades of impunity given by the Israeli government to settler terrorism." Four family members of the one-and-a-half year-old were transferred to Israeli hospitals for treatment earlier Friday after the attack, which the Defense Ministry, IDF, Prime Minister Binyamin Netanyahu, and greater political establishment condemned as "despicable." One MK, Jewish Home representative Bezalel Smotrich, warned earlier Friday to be alert for the PA to use the incident as a means of inciting terror against Jews. "Murderous terrorism against Palestinians should not be a reason to attack Jews, but they are using it as an excuse to boost terror activity," he warned after condemning the attack. The IDF is already taking active steps to contain the possibility of reactionary violence from the PA, IDF spokesman Lt. Com. Peter Lerner announced later Friday. The Jerusalem District Police Commander, Major General Moshe Edri, held a hearing Friday morning to assess the situation and later banned entry to the Temple Mount for Friday prayers to men over 50 and all women - a typical move Israeli security forces use to help prevent terrorist infiltration from the PA. Meanwhile, Central Command Chief of Staff Roni Numa has met with the leaders of all of Israel's security forces, the Israel Security Agency (ISA or Shin Bet), and the Israel police to determine further steps to prevent escalation. The IDF has, in addition, sent no fewer than four full-fledged battalions to find the perpetrators.